When Applewood Motors purchased a new dealership in Richmond, BC, they decided to investigate lighting solutions that delivered bright, high-quality light while helping to reduce energy consumption in one of the facility’s key areas: dealer lots. Outdoor lighting in lots is one of the most important areas to consider when upgrading auto dealer lighting, as it is often the first impression customers see when entering the facility, as well as one of the largest users of electricity at a dealership. The company had used traditional metal halide high intensity discharge (HID) fixtures at his other dealerships. 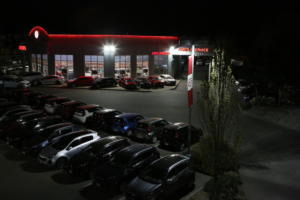 Before committing to replacing the lighting at the larger Richmond dealership, they decided to replace the lighting at their smaller Fleetwood location and before installation began, the dealership met with Metcalfe Lighting, part of the BC Hydro Power Smart Alliance, to discuss outdoor lighting options. 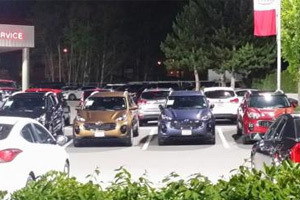 Metcalfe Lighting recommended outdoor LED lighting as a good solution for providing both energy savings and the desired quality of light needed to showcase the dealerships 150-vehicle inventory. After reviewing the options, the dealership chose E-Lite Semiconductor Edge™ LED Area Lights for their reduced energy consumption, long-rated life and sleek design. Fifteen 437-watt Edge LED Area Lights were mounted on 7 25-foot poles, with two fixture mountings per pole. E-Lite Semiconductors outdoor LED lighting fixtures at Applewood KIA have a correlated color temperature (CCT) of 5000K and a color rendering index (CRI) of 87. In addition, E-Lite Semiconductor LED Edge design efficiently directs light without wasteful and unwelcome light spill into neighboring properties. The new LED lighting showcases the cars individually and really highlights the color of the vehicles on the lot. Plus, E-lite Semiconductors thin lighting fixtures have a more elegant look compared to bulky metal halide fixtures. By more efficient use of the light they produce, LED lighting is designed to deliver significant reductions in energy usage and maintenance costs when compared to HID and other technologies, which the dealership is noticing at their Fleetwood, Surrey location. 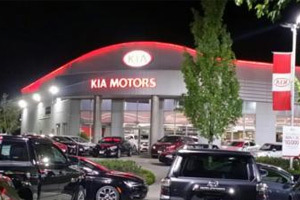 Applewood KIA realizes a 20-33% increase in energy savings with new outdoor LED lighting. Contact an LED Lighting expert today for more information on LED Lighting and the best solution for your application. 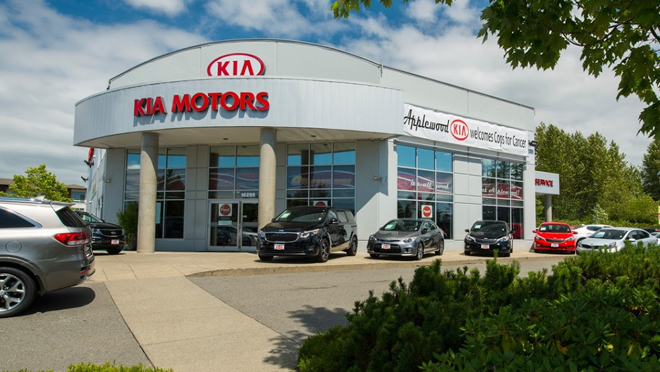 After the LED lighting upgrade at Applewood KIA, this commercial LED lighting project helped save a total of 53762.3 kWh of energy annually. Applewood KIA – Applewood Auto Group.